Participants in the Literature Festival are pictured in the new venue for opening night as they were kicked out of the Palestinian National Theater by soldiers carrying out their government's genocidal plan to rid Jerusalem of its Palestinian culture. 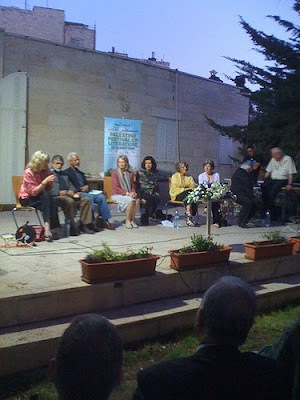 Unfortunately, I can't get this video from Day 1 of the 2009 Palestinian Festival embedded, but here is the link. And here is a video of Chinua Achebe reading his poem "Refugee Mother and Child" for the 2008 Palestinian Literature Festival. Achebe, the acclaimed author of Things Fall Apart is a patron of the Paletine Literature Festival. "Today, my friends, we saw the clearest example of our mission: to confront the culture of power with the power of culture." Follow the festival, which takes place from May 23-28 here.